Downtown Georgetown is beautiful, scenic, and historic – three attributes which are fully reflected in the Rice Museum. Known locally as the Town Clock, the Rice Museum is located in the Old Market Building where it documents the impact rice had on Georgetown and South Carolina through artwork, artifacts, interactive tours, maps, and dioramas. Part of the Rice Museum tour includes the Maritime Museum Gallery, located in the former Kaminski Hardware Building. It houses the Browns Ferry Vessel, the oldest vessel on exhibit in the United States. Also located in the building is the Prevost Gallery and Museum Gift Shop. The Prevost Gallery features rotating exhibits of local art and history. The first market built on this site was a wooden structure built in the early nineteenth century. It was destroyed by a hurricane and replaced with this Greek temple-style building on a raised pediment around 1842. In 1848 the bell tower and clock were added. The open-air ground floor of the market was used to sell produce, livestock, and – unlike the famous Charleston Market – slaves. The second floor was utilized as Town Hall, and some time after the Civil War the ground floor was enclosed. Senegalese, Gambians, and Angolans were captured by hostile tribes and sold to European and American traders who valued their rice-growing skills. Some believe Angolan slaves gave rise to the word “Gullah” through a shortened version of Angola – N’Gulla. 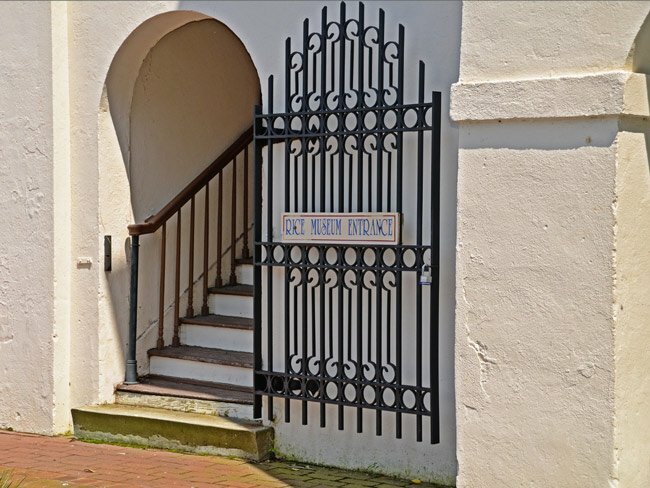 The Civil War erupted at Fort Sumter in 1861 and changed Georgetown forever. Planters struggled to keep the rice industry alive without a free labor pool, while several major hurricanes devastated Lowcountry fields. To further complicate matters, rice planters in Louisiana, Texas, Arkansas, California, and Mississippi began serving up some stiff competition. They benefited from modern harvesting equipment, but coastal South Carolina’s wet, muddy soil could not support the heavy machines. In the face of these obstacles, rice was no longer a viable crop, and Georgetown’s last commercial harvest took place in 1919. The Old Market Building is an outstanding example of architecture utilized to serve both the political and economic life of the 19th century. 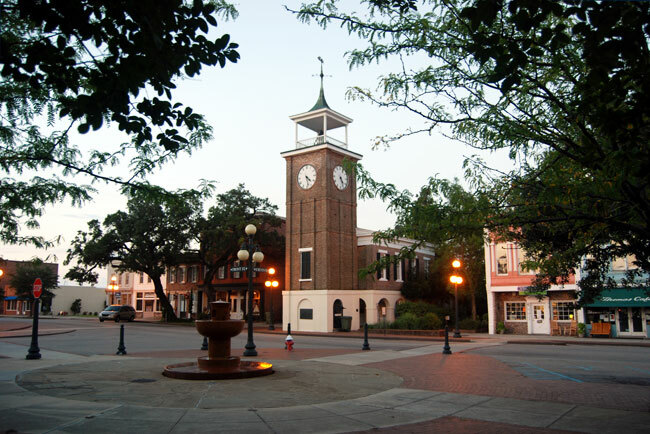 As one of the few remaining brick market buildings in the US with a bell tower and clock, this structure has served as a town hall, a jail, an open-air market, and a slave market. At the time of nomination it served as the Georgetown Rice Museum. Built ca. 1832-1835, this distinguished one-story Classical Revival temple form building was designed to rest on a high arcaded base. The arched area was used as an open air market but was enclosed in the early twentieth century. The front façade of the market is laid in Flemish bond, with the side and rear wall in common or American bond. The tower and market are unified by the belt course encircling them. In ca. 1842 a tower topped by a square stage and an open belfry was added. The tower houses a four-sided clock. 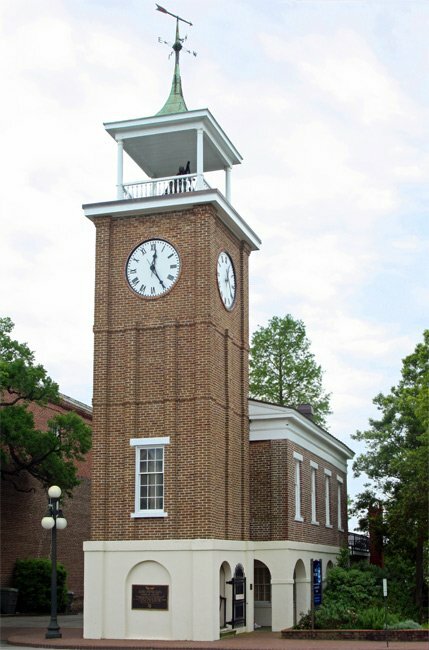 Contributor Paige Sawyer adds the following information: “The town clock building is a Greek Revival structure and was originally used as an open air market. As early as 1788, the site at the foot of Screven Street had been the location of the town market. The brick building replaced an earlier wooden structure. In February of 1865, when Federal troops occupied Georgetown, the town council signed surrender papers in this building. I have to make a correction to the date I had given. It was 1986 or 1987 not the 1970s when I visited the Rice Museum and thought the display looked different then it does now. I had visited the Rice Museum in the early 1970s and remembered a different layout of the displays with large glass displays in the center of a room. Had that been changed to todays display? I was there today October 20th 2017. I went to the Rice Museum today, it was very nice. The USA Rice Federation tells us: There are several stories regarding the introduction of rice to America. One talks of a Dutch ship that in 1694 set sail from Madagascar. Storm-battered, it took refuge in South Carolina’s Charleston Harbor, Charleston’s inhabitants gave the crew a warm welcome and helped repair the ship. The departing ship’s English captain expressed his gratitude to the community by presenting it with a sample of his cargo, ‘Golde Seed Rice’. These precious rice seeds were the forerunners of a now famous rice type – ‘Carolina Gold’. South Carolina became the first American state to farm rice, although following the Civil War it ceased to do so, and rice farming moved westward to Arkansas, Louisiana and Texas. The owner of Anson Mills suggested Dr. James Fitch mentioned Italian farmers were the first to bring rice cultivation to the Lowcountry.